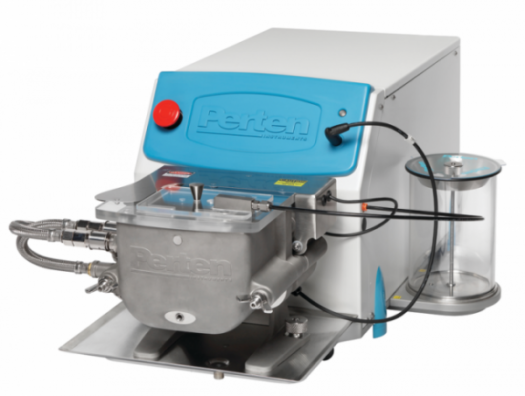 The doughLAB is a adaptable dough rheometer with standard z-arm mixing action. The doughLAB includes a user-friendly Windows program with traceable calibration designed for both millers and researchers, with automated water dispensing. The mixing chamber and blades are detachable for simplified cleaning. It has changeable temperature and mixing energy to mimic commercial situations, evaluates finished dough performance, investigate the response of a dough to changing stress levels and perform world standard methods for water absorption and flour quality with one machine. Work out dough mixing profile, development time, stability, softening and other quality parameters of wheat, rye and durum doughs for milling, baking, and food applications. Flour, wholemeal, semolina and formulations containing ingredients can all be tested. Create custom tests for all variety of doughs. The doughLAB is a conventional sigma arm dough mixer which measures water absorption (WA) and dough mixing parameters. The doughLAB uses customisable mixing speed and temperature, built in water dispensing, Windows control software for both testing and analysis, and traceable calibration. Open the appropriate doughLAB method in DLW software and enter sample data. Precisely weigh the amount of flour calculated. Open the lid of the mixing bowl and pour the flour into the bowl. Shut the safety lid. Place the water dispensing head in the bowl lid. Initiate the testing sequence. When necessary scrape down the sides of the bowl carefully to mix the dough, with the spatula provided. Secure the evaporation shield to reduce evaporation of water. The resistance of the dough will be displayed in a graph on the monitor. Wheat flour doughs are nonlinear viscoelastic materials, and as such there is a complicated relationship between the strains imparted during mixing (stretching, shearing, compression and relaxation) and dough resistance. A series of factors related to processing conditions and flour type will also have a considerable effect on the way the dough acts. Variations in water and protein levels, changes in the structure of the protein, starch, starch damage, pentosans, gluten strength and the interaction of enzymes on the dough components all affect dough behaviour. Due to the intricate nature of dough behaviour an empirical instrument test is wanted. The two key pieces of information required by millers and bakers are absorption (amount of water required for a dough to reach a defined consistency) and the mixing profile of the dough (development time, stability and softening) which are indicative of the usability of the flour in different applications. Other parameters may also be measured. Specific applications include the study of gluten and carbohydrate functionality, enzyme activities in flour, functions and effects of dough ingredients (dried dairy ingredients, organic acids, salt, emulsifiers, antioxidants, yeast , sugar, improvers and enzymes), properties of composite flours, effects of special flour treatments and replication of commercial processes. User Friendly: Windows software with standard and easily customizable methods, real time graphs, data analysis, diagnostics and virtual blending. for repeatable, operator free measurement of water absorption. Reduce test time to 10 minutes, develop hard samples, research dough response to changing stress, incorporate ingredients, study stiff doughs and new dough formulations and use high energy mixing to replicate commercial mixing processes. Measure the heating and gelling characteristics of dough. Flexible dough rheomoter with conventional Z-arm mixing action. Built-in automated temperature control and water dispensing. DLW software for instrument operation and data management included in delivery. PC to be provided by customer. Bowl not included, select 300g or 50g bowl below. Small (4 gram) sample size dough rheometer with conventional Z-arm mixing action. Bowl with mixing blades included. DLW software for instrument operation and data management included in delivery. PC to be provided by customer. Pasta and Asian products (eg steam bread, noodles and flat bread) laboratories who need to test wheat flour quality and processing characteristics.